CannaSmack Luxe Orange Lip Scrub features a 100% natural and vegan, cruelty free formula that is infused with premium hemp seed oil and orange oil. Raw sugar granules exfoliate your lip’s dead skin cells while our blends of Candelila wax and natural oils moisturize your lips leaving them smooth and silky. 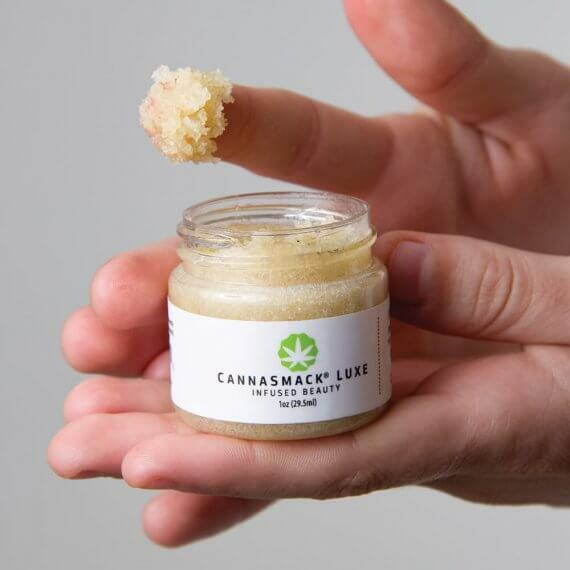 Directions: Apply a small ammount of CannaSmack Luxe Orange Lip Scrub to finger tip and massage onto your lips. Rinse with warm water. Apply once or twice per week. Ingredients: Raw Sugar, Cocoa Seed Butter, Jojoba Seed Oil, Candelila Wax, Cannabis Sativa (Hemp) Seed Oil, Orange Oil. I am a male with full lips. I struggle with dry lips for majority of the year regardless of the season. I thought, “why not give lip scrub a try?” after searching for unique solutions at the time of purchase. I go outside of the recommendation and use this almost every night after I shower before bed. The consistency is really interesting. It’s extremely firm and slightly waxy in addition to the sugar shards that are mixed in to add extra exfoliation to the lips. I apply this product, exfoliate, rinse with warm water and then finish by going over the lips with a handy CannaSmack lip balm. After getting into this cycle for a good week or two now I’m noticing that my lips are hydrate and soft. ….Can’t ask for much more, right? Give it a try! The only request I have with this product would be to offer in different flavors (the orange is great though!). PS. A very, very, very tiny bit of this product goes a long way. Long lifespan for a great price! The orange scent is so refreshing and my lips feel great! It’s great for exfoliating and getting matte lipstick off! What are dry chapped lips!? I couldn’t tell you, thanks to this amazing product paired with some Cannasmack Lip balm, my lips are silky smooth ? ?